ONE would think that a full-time, professional posting to a place like Jackson, Wyoming would be a difficult thing for just about anybody to pull off. The place is so notoriously gorgeous, with the spectacular Tetons towering over the town, with Yellowstone National Park just a few miles away, with fresh air and open skies and a laid-back Western lifestyle  all of it so picturesque and cool that even Coloradoans are envious. For Rabbi Zalman Mendelsohn, however, getting sent to work and live full-time in Jackson was no problem at all. Hence his stewardship of an increasingly popular Jackson-based entity called the Chabad Jewish Center of Wyoming  not to mention his limitless gratitude. We absolutely love it, he says, including in his first-person plural his wife Raizy and young daughters Chayale, Chanie and Rochel. Then back to Jackson, and Wyoming in general. So much so that they have virtually adopted the community in Jackson which, in turn, seems to have adopted them. SO how, the rabbi is asked, did he manage to wrangle such a job in such a paradise? He quickly refutes the notion that his appointment to Jackson was a result of good connections in Crown Heights, the Brooklyn neighborhood where the Chabad Lubavitch movement has its world headquarters. When we moved here five years ago there was very little interest in anybody coming to Wyoming, Rabbi Mendelsohn says. Rabbi Mendelsohn performed that duty himself for three summers, visiting all over the state, he says, and none of the rabbis who had visited here before I did felt that it was a place that would be able to open up a Chabad center. Born and raised in Miami Beach, Rabbi Mendelsohn was the son of parents who grew up largely secular, as maybe once or twice-a-year Jews, who gradually began to incorporate Jewish observance into their lives. A first-generation Chabadnik himself, the rabbis early training took place in exotic locations, to put it mildly. He lived and worked in Beijing, China for several months, for a year in Singapore and for several months in Thailand and Nepal. To some degree, he had a hand in choosing these distant, and in Jewish terms at least, quite isolated places. I had an interest in seeing different parts of the world as a rabbi, he explains, adding that he has long harbored an interest in Sephardic Jewry and the Jewish communities of Asia, including Chinese Jewry. His interest in Jewish demographics and the different lifestyles of Jews from all over the world eventually led him not only to Asia but to Wyoming. WHEN asked whether Jackson is Wyomings version of Aspen, Colorados ultra-scenic, high-end, often celebrity-laden vacation destination, Rabbi Mendelsohn is quick to quash the notion. Those 500 full-timers, however, arent the whole story in Jackson. The community is growing, Rabbi Mendelsohn says. There are several hundred Jewish people who have bought homes here. They dont live here full-time, but they visit every year. Then there are about 40,000 Jewish people who visit here every year. And most of them are not very religious. They are, in other words, the perfect target audience for Chabads outreach efforts. We operate most of our activities, including Shabbat services, in hotels. Every weekend for dinner we can have anywhere between five and 50 people joining us. He is very pleased with the turnout, the rabbi says, noting that Chabad is sometimes able to attract as many as 100 people to its events. Summertime, with its mix of full-time and part-time residents and vacationers, is definitely the up season, and for a very simple reason. REGARDLESS of the season, these Jewish Jacksonites have little trouble finding the local Chabad house. If we wanted to hide, we couldnt, Rabbi Mendelsohn says with a laugh. But why would these Jews  most of whom are marginally observant if at all  look up an obviously Orthodox organization like Chabad? Its interesting, the rabbi says. Ive found out that people who are traveling will often seek out a synagogue even if theyre not active with a synagogue back home. People who dont participate in services at home will do so on a vacation where they dont have such a tight schedule. Rabbi Mendelsohn sees it as an obvious opportunity. SOMEWHAT ironically, being in Jackson means that for the rabbi and his own family its considerably more difficult to maintain an Orthodox lifestyle themselves. Their eldest daughter Chayale, who is five years old, studies Jewish subjects via the Chabad Online School while the family hires tutors to help her with general subjects, a method they plan to continue for all of the daughters. The reason for this improvised educational system is simple: The nearest Jewish religious school is hundreds of miles away. Its a significant challenge, the rabbi admits, to live in a place with so little Orthodox infrastructure. I wouldnt recommend it to anyone other than a Chabad family thats moving out to provide Jewish education, to be there as a servant of the Jewish community. 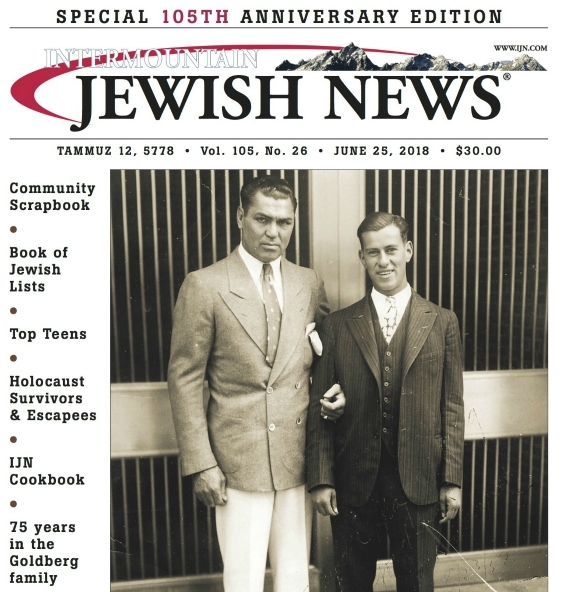 But to move to a place that doesnt have a strong Jewish infrastructure is not something that I would recommend to families from Denver, for example, because we dont have Jewish day schools or kosher stores. There are challenges that come along with it, so its not easy. It bothers me regularly that I dont have a minyan that I can pray with every single day. It so happens that we dont currently have a mikveh. The same Wyoming pioneer spirit must be applied to kosher food. The Mendelsohns help locals and visitors obtain kosher food if they want and request it. We ship in our kosher food every few months, Rabbi Mendelsohn says. We do a large shipment. Together with ourselves, there are several families here that order together with us. For visitors that are coming through we offer them kosher foods. Its a way both of maintaining their own educational focus and encouraging visitors to support the local economy. RABBI Mendelsohn has no expectation that Wyoming will become the Orthodox capital of the American West. Like all Chabad slichim, hes not out to create Jewish duplicates of himself, merely to plant Jewish seeds that he hopes will take root. Every single mitzvah that a Jewish person does is an infinite and endless connection to Hashem, to G-d, he says. The objective isnt to be able to ensure that they become as observant as I am. The objective is to be able to connect with them on a one-time basis and in a most impactful and meaningful way and encourage them to participate, at their speed, their level, at their convenience. The rabbi, however, might very well tell his friends and clients that if theyre giving any thought to delving deeper into Judaism, Wyoming is an excellent place to do it. Every time I drive past the Tetons and look out at the beautiful scene it definitely brings me closer to G-d and to faith, he says. And the same thing applies to all the people living here. Theyre a very spiritual community. Its hard not to be spiritual out here. The transition in New York for a person whos not active in the Jewish community to become active is possibly more difficult, in a large city where there isnt so much natural beauty. Here, that transitional process is a little bit easier. There is a reason why they call this area G-ds Country.